45 Commando Royal Marines (pronounced "four-five commando") is a battalion sized unit of the British Royal Marines and subordinate unit within 3 Commando Brigade Royal Marines, the principal Commando formation, under the Operational Command of Commander in Chief Fleet. The Corps of Royal Marines (RM) is the amphibious light infantry and one of the five fighting arms of the Royal Navy. The Royal Marines were formed in 1755 as the Royal Navy's infantry troops. However, the marines can trace their origins back to the formation of the English Army's "Duke of York and Albany's maritime regiment of Foot" at the grounds of the Honourable Artillery Company on 28 October 1664. Tasked as a Commando amphibious unit, 45 Cdo RM is capable of a wide range of operational tasks. Based at RM Condor,  their barracks in Arbroath, personnel regularly deploy outside the United Kingdom on operations or training. While 3 Cdo Bde RM are the principal cold weather warfare formation, personnel are capable of operating in a variety of theatres including tropical jungle, desert or mountainous terrain. The Commando is a regular participant in the annual Brigade cold weather warfare exercise in Norway, having been the first UK unit to specialise in the mountain and Arctic warfare role during the early 1970s and deployed to Norway on NATO's northern flank most years until the end of the Cold War. RM Condor is a large Royal Marines base located near Arbroath in East Angus, Scotland. The base also houses 7 (Sphinx) Battery Royal Artillery, part of 29 Commando Regiment Royal Artillery. Arbroath or Aberbrothock is a former royal burgh and the largest town in the council area of Angus in Scotland, and has a population of 23,902. It lies on the North Sea coast, around 16 miles (25.7 km) ENE of Dundee and 45 miles (72.4 km) SSW of Aberdeen. All personnel have completed the Commando course at the Commando Training Centre(CTCRM) at Lympstone in Devon, entitling them to wear the green beret, with attached personnel having completed the All Arms Commando Course. Commando Training Centre Royal Marines (CTCRM) is the principal military training centre for the Royal Marines. 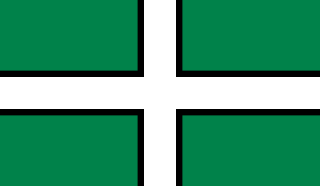 It is situated near the villages of Lympstone and Exton, between the city of Exeter, and the town of Exmouth in Devon. The centre delivers new entry training to recruits. Lympstone is a village and civil parish in East Devon in the English county of Devon. It has a population of 1,754. There is a harbour on the estuary of the River Exe, lying at the outlet of Wotton Brook between cliffs of red breccia. The promontory to the north of the harbour is topped by a flat pasture, Cliff Field, that is managed by the National Trust and used for football matches and other local events. Mobilization, in military terminology, is the act of assembling and readying troops and supplies for war. The word mobilization was first used, in a military context, to describe the preparation of the Imperial Russian Army during the 1850s and 1860s. Mobilization theories and techniques have continuously changed since then. The opposite of mobilization is demobilization. Brookwood is a village in Surrey, England, about 3 1⁄2 miles (5.6 km) west of Woking, with a mixture of semi-rural, woodland-set and archetypal suburban residential homes. It lies on the western border of the Woking Borough, with a small part of the village in Guildford Borough. As part of the 2016 boundary review Brookwood became part of the Heathlands ward which comprises Brookwood, Bridley, Hook Heath, Mayford, Sutton Green and Barnsbury and Wych Hill. Achnacarry is a small hamlet, private estate, and a castle in the Lochaber region of Highland, Scotland. It occupies a strategic position on an isthmus between Loch Lochy to the east, and Loch Arkaig to the west. The 1st Special Service Brigade was a commando brigade of the British Army. Formed during the Second World War, it consisted of elements of the British Army and the Royal Marines. 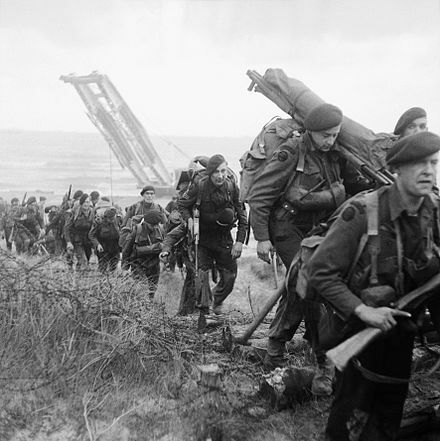 The brigade's component units saw action individually in Norway and the Dieppe Raid, before being combined under one commander for service in Normandy during Operation Overlord. On 6 December 1944, the Brigade was redesignated 1st Commando Brigade, removing the hated title Special Service and its association with the German SS. Royal Navy Westland Whirlwind helicopters taking the first men of 45 Royal Marine Commando into action at Port Said from HMS Theseus. A British Royal Marine from 45 Commando watches for enemy tanks and armoured personnel carriers from behind his anti-armour weapon as part of Combined Joint Task Force Exercise '96. Ground crew with the Commando Helicopter Force huddle from the downwash of a Sea King helicopter on exercise in Norway. Members of Whiskey Company, 45 Commando Royal Marines patrolling across barren landscape from FOB (Forward Operating Base) Jackson at Sangin in Helmand Province in Afghanistan. Operation Veritas was the codename used for British military operations against the Taliban government of Afghanistan in 2001. British forces played a supporting role to the American Operation Enduring Freedom. 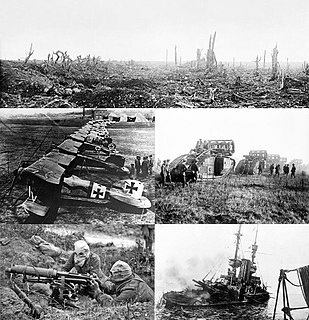 In addition, the British contribution was an important part of the overall forces deployed. Operation Veritas also incorporated Operation Oracle, Operation Fingal, and Operation Jacana. It was succeeded by Operation Herrick from 2005 onwards. The 43 Commando Fleet Protection Group Royal Marines, formerly Comacchio Company Royal Marines (1980–1983), Comacchio Group Royal Marines (1983–2001) and Fleet Protection Group Royal Marines (2001–2012), is a 550-man unit of the Royal Marines responsible for guarding the United Kingdom's Naval nuclear weapons and providing Royal Marine Boarding Teams and the very high readiness Fleet Contingent Troop to conduct maritime interdiction operations in support of the Royal Navy. The unit, based at HM Naval Base Clyde, is part of 3 Commando Brigade. The 1st Battalion, 6th Marines (1/6) is an infantry battalion in the United States Marine Corps based in Camp Lejeune, North Carolina. It consists of approximately 1,100 Marines and Sailors. They fall under the command of the 6th Marine Regiment, the 2nd Marine Division of the II Marine Expeditionary Force. The 3rd Battalion, 9th Marines (3/9) is an infantry battalion of the United States Marine Corps. Formed during World War I it served until the early 1990s when it was redesignated as 3rd Battalion, 4th Marines (3/4) during a realignment and renumbering of the Marine Corps' infantry battalions, following the deactivation of the 9th Marine Regiment. The 3rd Battalion, 9th Marines was initially a subordinate unit of the 9th Marine Regiment, 3rd Marine Division, but was later operationally transferred to the 1st Marine Division as a subordinate unit of the 7th Marine Regiment where it remained until its redesignation as 3/4. 42 Commando is a subordinate unit within the Royal Marines 3 Commando Brigade, the principal Commando formation, under the Operational Command of Fleet Commander. The United Kingdom was one of the first countries which took part in Operation Enduring Freedom to topple the Taliban regime in autumn 2001. This is the Operation Herrick ground order of battle, which lists any British ground forces that have taken part in the duration of Operation Herrick between 2002 and 2014. General Sir Gordon Kenneth Messenger, is a senior Royal Marines officer who has been Vice Chief of the Defence Staff since May 2016, succeeding Air Chief Marshal Sir Stuart Peach. As a colonel he commanded 40 Commando during the Iraq War, and led the Commando in the assault on the Al-Faw Peninsula. He served as British Commander of Task Force Helmand, during the 3 Commando Brigade deployment to Helmand Province, Afghanistan on Operation Herrick IX from 2008 to 2009. The current Royal Marines Armoured Support Group (RMASG) is an element of the Royal Marines that operates the Viking BvS 10 All Terrain Vehicle. It is based at Bovington in Dorset. The original RMASG was formed in the Second World War to give British and Commonwealth forces heavy fire support in the opening attacks of the Normandy Landings. 131 Commando Squadron Royal Engineers is an Army Reserve unit, and part of 24 Commando Regiment Royal Engineers. It provides engineering support to 3 Commando Brigade Royal Marines and is the largest Army Reserve Commando unit. The squadron has deployed worldwide to provide combat engineer support to 3 Cdo Bde RM, often deploying in small sub-units. 131 was first raised in 1947 as an airborne engineer regiment, and reached a strength of over 1,000 trained parachute engineers by the early 1960s. Between 1 April 1978 and 1 October 2015, the unit was an independent Commando squadron under operational command of HQ 3 Cdo Bde RM. On 2 October 2015, it formally became the third squadron of 24 Commando Engineer Regiment. 41 Commando or No. 41 Commando was a unit of the Royal Marines trained as Commandos during the Second World War. They were part of the all Royal Marine 4th Special Service Brigade that took part in the Normandy landings in June 1944 and later that served in World War II, the Korean War, and in Northern Ireland. They were disbanded in 1981. FOB Delhi in Afghanistan is a military expeditionary base occupied by the United States Marine Corps. It is along the Helmand River Valley in Garmsir at an abandoned Agricultural College building. 3 Commando Brigade Air Squadron, Royal Marines, was formed in 1968 in Singapore by the amalgamation of three Commando Air Troops and the Brigade Flight. The squadron moved to Plymouth in 1971 and the two remaining UK Commando Air Troops became part of it. Apart from during the Falkands War, when the whole squadron was involved, it operated mostly on individual flight detachments. 3 Commando Brigade Air Squadron became 847 Naval Air Squadron in 1995. ↑ Royal Marines Commando — Individual Unit Histories Archived 28 November 2007 at the Wayback Machine .. Former HMS Condor which became RM Condor in 1971. ↑ "45 Royal Marine Commando: The Normandy Landings". Combined Operations. Retrieved 17 April 2016. 1 2 "Memorial dates" (PDF). Royal Navy. Retrieved 17 April 2016. ↑ "No. 36972". The London Gazette (Supplement). 6 March 1945. p. 1297. ↑ "Royal Marines Commando and Special Boat Service". Commando Veterans Association. Retrieved 17 April 2016. ↑ "1956: Allied Forces take control of Suez". BBC. Retrieved 4 April 2016. ↑ "The Tanganyika Army Mutiny 1964 and The BFPO Field Post Office". GB Stamp. 11 November 2014. Retrieved 22 May 2016. 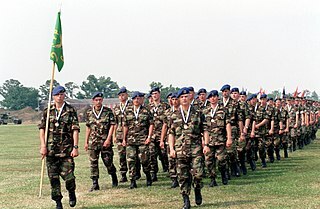 1 2 "Air Troop 45 Commando RM". British Army Units 1945 on. Retrieved 17 April 2016. ↑ "Arbroath's military men". BBC. 19 March 2002. ↑ "No. 49134". The London Gazette (Supplement). 8 October 1982. p. 12834. ↑ "Mitch: Picking up the pieces". BBC. 18 November 1998. Retrieved 17 April 2016. ↑ "UK's mountain warfare elite". BBC. 18 March 2002. ↑ "House of Commons - Written Answers for 4 Oct 2004 (pt 31)". Parliamentary Debates (Hansard) . House of Commons. 4 October 2004. ↑ "Royal Marines - Operation Telic". Elite UK Forces. Retrieved 17 April 2016. 1 2 "Thousands turn out in Arbroath to greet returning Royal Marines". Daily Record. 22 May 2009. ↑ "Defence written question". House of Commons. 23 October 2013. Retrieved 17 April 2016. ↑ "Handover in Helmand as 3 Cdo Brigade replace 16 Air Assault Brigade". Ministry of Defence. 9 October 2006. ↑ "3 Commando Brigade to replace 16 Air Assault in Afghanistan". Ministry of Defence. 8 July 2008. Archived from the original on 8 July 2008. ↑ "3 Commando Brigade Take Command Of Task Force Helmand". Ministry of Defence. 11 April 2011. ↑ "3 Commando Brigade to replace 16 Air Assault Brigade in Helmand". Ministry of Defence. 17 December 2010. ↑ "Royal Marines end cold weather training with three hour battle" . Retrieved 4 April 2016. ↑ "Exercise African Winds blows through Ghana" . Retrieved 4 April 2016. ↑ "Marines rehearse casualty evacuations in Benin" . Retrieved 4 April 2016. ↑ "Defence in the Media – 26 May 2016" . Retrieved 28 May 2016. French, David (2015). Fighting EOKA: The British Counter-Insurgency Campaign on Cyprus, 1955-1959. Oxford University Press. ISBN 978-0198729341. Fowler, Will (2009). Royal Marine Commando 1950-82: From Korea to the Falklands. Osprey. ISBN 978-1846033728. Moreman, Timothy Robert (2006). British Commandos 1940–46. Osprey Publishing. ISBN 1-84176-986-X. Samain, Brian (2005). Commando Men: The Story of a Royal Marine Commando in World War Two. Pen and Sword. ISBN 184415209X. Young, David (1972). Four Five: Story of 45 Commando Royal Marines 1943-1971. Leo Cooper. ISBN 0850520932. Wikimedia Commons has media related to 45 Commando Royal Marines .